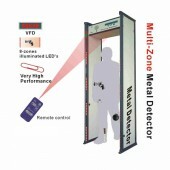 What you are viewing is the Walk Through Metal Detector with 6 Zone Areas which is made up of two parts: left -right detecting gatepost and mainframe. This product is the updated version of VO-1000 and it possesses high sensitivity and multiple detecting areas, besides 6 detecting areas spreading evenly over the left-right detecting gatepost from its top to bottom. And built-in LED indicating lights are also being used on each side of detecting gate. This device is indicated by picture and the left-right detecting gatepost is formed up by unified mold, besides other parts own waterproof designs, so it is normal even when it is in the water. 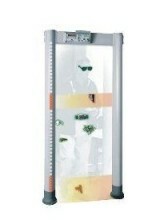 And this device is easy to assemble, disassemble or move as it has an exquisite design with light weight and solid stand. What’s more it owns function of function of password protection and function of recover systematic parameters by one-key, these two functions are really useful. It also owns high sensitivity and the ability of adjusting the audio tones, adapting to different usage environments. Thus this device cause no harm to human’s body. Such a good device can be used in places like airport, customs clearance of export, stadium, court, tribunal, prison and many other important places. What a powerful product it is! If you want to buy one, just come here and contact us, then you will get the high quality product from detectorall at the best price. Time waits for nobody, just seize the chance. Happy purchasing experience, hope that we can cooperate again. It is really a happy purchasing for me, i hope that we can cooperate again in the future. This product is easy to operate, it provides a lot of convenience to my life. With advanced technology, it owns multifunction. I like it very much.